The Portuguese describe the Algarve as 'a mirage of heaven on earth'. Whether that's true or not, it's undeniable that the best beaches in Europe are still located here, along a shoreline stretching for over 150km. Since the Sixties, they've brought Europeans flocking, especially from Britain, the majority of visitors coming with families. And how the Iberians have cashed in - some would say too much, cheapening the region's appeal. Others however, still find here peace and a quality of life unimaginable back home. Time to reassess the Algarve - in concert with something else in need of reassessment: Ford's Focus C-MAX. This mini-MPV was launched in 2003 to a fairly muted reception partly due to the fact that two other small people carriers announced at the same time (Renault's Scenic and Volkswagen's Touran) garnered the lion's share of the publicity. Both offered derivations that could seat up to seven, while the C-MAX doggedly stuck to the conventional five-seat format. Subsequently, the car has almost been forgotten in the flood of publicity surrounding the launch of the more standard second generation Focus range. Which is a pity for the C-MAX is a very good car indeed. Indeed, I'd always harboured a suspicion that, provided you don't really need to seat seven on a regular basis (and let's face it, how many people really do? 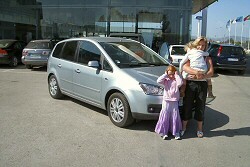 ), then it may just be the best all-round family car you can buy. Hence my choice of transport to take wife Katie and two small children Caris (nearly 7) and Ellie (just 4) around Portugal. Safety was another factor in the decision, given that the roads around the Algarve are statistically the most dangerous in Europe. NCAP tests reckon the Ford is amongst the safest compact cars you can buy, something due as much to careful design as to the fact that twin front, side and curtain airbags join anti-lock brakes and Electronic Brakeforce Distribution on the standard equipment list. Coast-wise, the Algarve is divided into two parts, with cliff-dominated beaches from Albufeira to Sagres, while dunes and sands dominate as far as the eye can see in the opposite direction towards Sotavento. It isn't all Costa del package tourist though. For example, the 'Costa Vicentina', which begins in Sagres and stretches northwards, has many small, yet charming beaches, some of them only accessible by boat. We chose the cliffs of Albufeira and Sheraton's Pine Cliffs resort, a complex an easy forty minute drive from the low cost flight destination of Faro airport. The place was very comfortable and convenient with a great Kids Club (which was the main reason we chose it) but had Katie and I been travelling alone, we would have doubtless opted for something a little more Iberian and authentic. "The roads around the Algarve are statistically the most dangerous in Europe ..."
As a compromise, we ventured out of the complex's gates every night into the interior in search of truly local sights, sounds and cuisine. And this of course is where you experience the real Portugal, swamped forever under the weight of tourist expectation on most of the beaches of the Algarve. Pointing the C-MAX just a few miles inland however, it was a very different story. The cheerfully green landscape, the sweet smell of almond blossom and rosemary, the spotlessly clean white houses pale against the fresh blue sky. Little towns where children play in the cobbled streets and old men sit in the shade and tell tall stories while others recall legends about enchanted beautiful Moorish women. Here and there, you find a small, stone-built tavern with long wood tables and enchanting smells. Freshly butchered pork, freshly baked bread from a traditional oven. The smell of new wine and the local arbutus berries boiling out of the artisanal alembic. Of course, given that this is a land of fishermen, this is a paradisiacal place for those who like fish and shellfish. Fish soups, octopus rice, dog-whelks with beans, fish stew, bread soup with shellfish and the most famous of the Algarve's dishes, the 'Ameijoas na Cataplana' (cockles). All of this you can find along the coast too of course but the beauty of venturing inland is that it blends this salty gastronomy with more varied rural flavours. 'Galinha Cerejada' (chicken in cherry sauce) for example. Or leg of lamb pot roast 'Cozido de Grao ou Repolho'. Then there's the broad beans, the snails with herbs and of course the pickled carrot, served with fish and meat, as a starting point for every meal. The sweet accompaniments centre on the use of local almonds and figs - 'Queijinhos', 'Morgadinhos', 'Nogados' and it goes on. All to be washed down with a Lagoa, Lagos or Tavira wine or with one of the Algarve's traditional liquors made of fruits or honey. Perhaps even a glass of local arbitus brandy. The Ford racked up the kilometres as we ventured further and further away in search of more of these experiences but the fuel gauge hardly seem to notice the odometer clicking away. We'd opted for the pick of the C-MAX's engine choices - the 134bhp 2.0-litre TDCI diesel, offering sixty from rest in 9.4s on the way to 125mph and, more importantly, a consumption average of over 50mpg. We particularly noticed the engine's pulling power on the undulating roads - and there are plenty of those. In the Algarve, the mountains create a kind of amphitheatre, gently sloping from north to south, from the Monchique and Caldeiro mountains to the sea. Summer temperatures average around 30 degrees C and were regularly over 33 degrees during our visit. Just as well then that the C-MAX boasted a very effective digitally controlled air conditioning system. Overall, our week with Ford's under-rated mini-MPV confirmed my preconception that it was just that: under-rated. Particular likes included the high-mounted gearstick, the high quality trim and the Sony stereo. Plus the roominess of the interior. Even with the rear pews in the standard three-abreast bench position, there's plenty of opportunity to stretch out, the car offering 946mm of legroom and 582 litres of luggage compartment space. As for the Algarve, I must admit to being surprised at just how easy it was to get away from the tourist trail and find the real Portugal of a forgotten generation. Enjoy it while it lasts.